November 3, 2014 June 29, 2018 P.O.P. So NOW Election Fraud Is Considered Newsworthy! There are three things as certain as death and taxes during an election season these days: (1) gas prices will fall at the pump; (2) the airwaves will be saturated with attack ads, and (3) the media will devote lots of time to airing warnings by Republicans that Democrats are out to “steal” the election. And they don’t mind making up stories to support their case. Normally, their claim is that such theft will be carried out by voters themselves — which, as we’ve discussed before, is extremely difficult to pull off, and too infrequent to have an impact on an election. (Not to mention which, many if not most of the documented occurrences actually involve high-profile Republicans.) In 2012, for instance, they floated rumors about busloads of dark-skinned immigrants with limited English skills being driven to the polls to vote — clearly fraud, right? At least one report even characterized them as “Somali pirates”. I don’t want everybody to vote. Elections are not won by a majority of people, they never have been from the beginning of our country and they are not now. As a matter of fact, our leverage in the elections quite candidly goes up as the voting populace goes down. 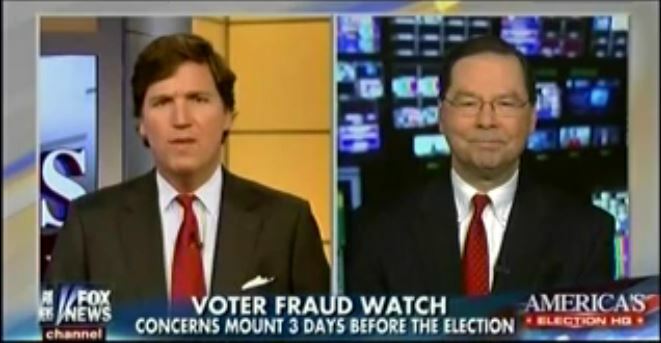 You can count on the media, and especially Fox “News” to shine a bright spotlight on every single case in which a Democratic voter is suspected of voting fraudulently. But the mysterious disappearance this year of more than 40,000 ballots from a Democratic stronghold in Georgia that could tilt that state’s elections? Not so much so. In seems that in order for suspected fraud to be considered newsworthy, it must meet two conditions: (a) it must be on an insignificant scale, and (b) it must be to the benefit of the Democratic Party. Thus, we have a great deal of attention devoted this year to a suspected case of actual election (as opposed to voter) fraud. It seems that a few machines in Illinois have been reportedly switching a few votes from Republican to Democrat. Officially, it’s just a glitch, but Fox “News” and their ilk are all over it, brandishing it as undeniable proof that Democrats have “hacked” the machines and are out to sabotage the electoral process and finish converting the nation to a colony of drones who’ll surrender their guns, convert to Islam and keep their radios tuned to NPR. The deliciously rich irony here is that Democratic and progressive activists have been struggling for years to bring greater accuracy, transparency and accountability to the electoral process. And they have very good reason. For one thing, voting machine glitches of this type have occurred before — except that the machines were flipping votes from Democrat to Republican. During the 2012 election, for instance, there were reports of machines in Pennsylvania switching votes. What say you, Fox? Same thing happened in Texas in 2006. Tucker? Sean? Bill? In Florida in 2000, voting machines in Volusia County awarded George W. Bush 4000 superfluous votes, while subtracting 19,000 from Al Gore’s tally. Rather than expose and investigate the irregularity, the media promptly seized upon the inaccurate totals to prematurely project Bush the winner (the first to do so was Bush’s cousin, John Ellis, who worked for — surprise — Fox “News”), permanently casting Gore as a “sore loser” and making it all but impossible for him to obtain a fair recount. Fox didn’t exactly jump all over those cases of fishy election activity. Could it be because the machines were switching votes from Democrat to Republican.? The vast majority of voting machines are produced by companies with strong ties to the GOP, and in some cases their execs have made it clear that they will do whatever it takes to deliver elections to the candidates of their choice. Still waiting for the Fox exclusive on that one? Nor are machines the only problem, by any means. As we discussed in the examination of Bush vs. Gore, Republicans have employed a mile-long series of dirty tricks to get into power and stay there. And these, mind you, are not merely isolated actions by individuals, but a widespread systematic process. In the 2000 election, George W. Bush was boosted into the White House by his governor brother’s unlawful purge of tens of thousand of Democratic voters from the rolls. The GOP’s tactics also include some very heavy-handed gerrymandering, which has allowed the party to gain congressional seats in the past two elections even though Democrats received more votes. In at least three states (Florida, Virginia and Wisconsin) GOP-mandering has been ruled unconstitutional. But like The Terminator, they’re no sooner struck down than they get back up and start it all over again. Fox, where art thou? Okay, since conspiracy theories are so popular these days, here are a couple to try on: (1) Maybe right-wingers are raising such a stink about the Democratic “fraud” in Illinois to divert focus away from their own sins — maybe they even hacked the voting machines themselves. (2) Or maybe Democrats really did fix the machines. Maybe they did it because they knew that was the only way to draw the media spotlight on the potential problems with voting machines, which thereby might lead to tighter regulation of said machines that would make it harder for anyone to cheat. Stranger things have happened. And infinitely stranger things have been believed. Next The Real Lesson of the Midterms? The most maddening thing about the Republican efforts to steal our elections is their constant efforts to project their own vices onto Democrats–probably a deliberate attempt to enrage Democrats, and make them want to say and do things, that the public will immediately jump on, as proof that Democrats are really unreasonable and are trying to blame every thing all on the poor GOP. Not only do do Republicans benefit when Democrats are moved to anger, But they also quick to accuse Democrats of being irrational and unprincipled–something which is, of course, a complete lie! No I don’t think Democrats are deliberately committing fraud via computers, just to focus the media’s attention on election fraud and thus, succeed in making the public aware of how big a problem really is. Their turn-the-tables strategy is more likely used in order to distract from their own sins, and make themselves appear to be valiant crusaders who are only interested in doing the right thing–keeping elections clean? I only wish the public would get hip to this ruse and realize what kind of audacious liars Republicans are! Democrats also lie and misinform, but not nearly to the same extent. A couple of weeks ago I sent a very short letter to one of our local opinion pages, and pointed to the fact that Wisconsin has had only one successfully prosecuted case of real voter impersonation fraud, (the type photo IDs are intended to prevent), and it was done by a person who voted several times for Scott walker–the guy who has been supposedly attempting to prevent such fraud? The editor printed my entire letter accurately, except for one little thing–she left out the fact that those fraudulent votes were cast by a fan of Governor Walker’s! I don’t know if the offender was really trying to besmirch the questionable integrity of Republicans, or, if he really was an unbalanced Walker fan who was caught in the act of doing something crazy—simply because he had failed to take his medication. The point, is in the irony of the crime committed, and, for some reason our editor refused to see that point—her deletion of this ironic fact was done by only taking out three words. So how in the world would she only have done so just for reasons of limited space or to maintain proper civility? Tonight is the mid-term elections and so far, it doesn’t look so good for Democrats, but the night is young, and perhaps if just half of the minorities, elderly, students and poor demographics just get out and vote, we might see a different ending completely! I totally understand why so many voters are pissed off about gridlock. But what is so absurdly apparent, is that many of them believe gridlock involves a 50/50 shared culpability? If they could just wake up and realize that only one side has been denying our need to pay off previously incurred debts, has forced the government to shut down, has voted to repeal the ACA at least 50 times, has resisted raising unemployment benefits, wants to cut food stamps, refused to lower the interest rates of college loans—(down to the same percentage paid by the banks), and even wants to “set us straight,” by repealing the ACA for (for the good of the middle class), voters would become aware of how they have been slyly convinced to vote against their own best interests?! I’d love to believe that all of this is just the growing pains of democracy and that Republicans aren’t really so bad just because they have different view about democracy than mine, but, what I see today is not too far removed from a mob mentality that thrives on power, and, deliberately uses fear for its own self-centered gains! Their hypocritical attempts to suppress votes, while committing massive types of election fraud themselves, are just more of many ways, that Oligarchs and tyrants cement their power. I only wish I could say this in less dramatic terms, or, that I didn’t have to say it at all! But I am really afraid that what is happening in American politics today is successfully destroying the last shreds of morality still present in our society!